Cominar REIT has a portfolio of industrial, retail and office assets in Montreal, Ottawa and Quebec City. The REIT delivered the 4th consecutive quarter of positive SPNOI growth in Q4 2018. Cominar offers an attractive 6%-yielding dividend. 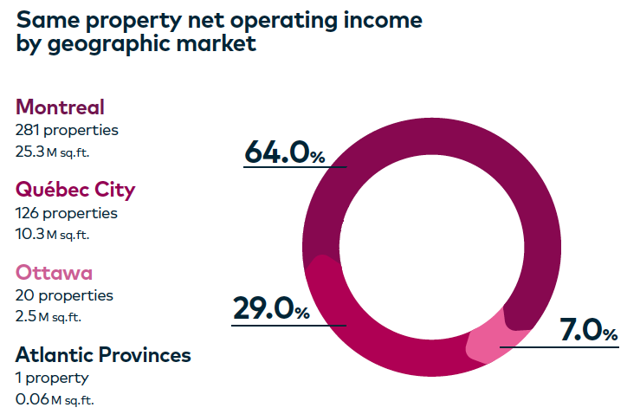 In Q4 2018, Cominar REIT (OTCPK:CMLEF, TSX:CUF.UN) delivered a much improved quarterly result with positive same property net operating income growth. Looking forward, the company should be able to benefit from a strong economy in Quebec, thanks to its concentration in the province. In addition, its disposition plan and development projects should help improve the portfolio quality and generate solid top and bottom line growth in the future. Cominar offers an attractive 6%-yielding dividend. We believe investors with a long-term investment horizon will be rewarded. Cominar delivered funds from operation of C$0.28 per share in Q4 2018. This was lower than Q4 2017’s C$0.34 per unit. The decline was largely due to the significant dispositions the company had done in 2018, coupled with some one-time items. On the other hand, its Q4 2018 SPNOI increased by 1.1%. This was the fourth consecutive quarter of positive growth. The growth was driven by increase of SPNOI in its office (4.1%) and industrial (1.2%) properties. However, its retail SPNOI declined by 2.2% in the quarter due to weak fundamental in the retail sector. Following several rounds of property dispositions, Cominar’s properties are now mostly located in the province of Quebec. The strategy to focus on its core Quebec markets is advantageous because Quebec’s economy is less volatile than other parts of Canada. Unlike Alberta, whose economy has been impacted by the oil market crash in 2015, Quebec’s economic growth rate has been stable and steady in the past few years (see table below). In fact, the province’s estimated GDP growth rate in 2019 is expected to be 10 basis points above the national average of 1.5%. 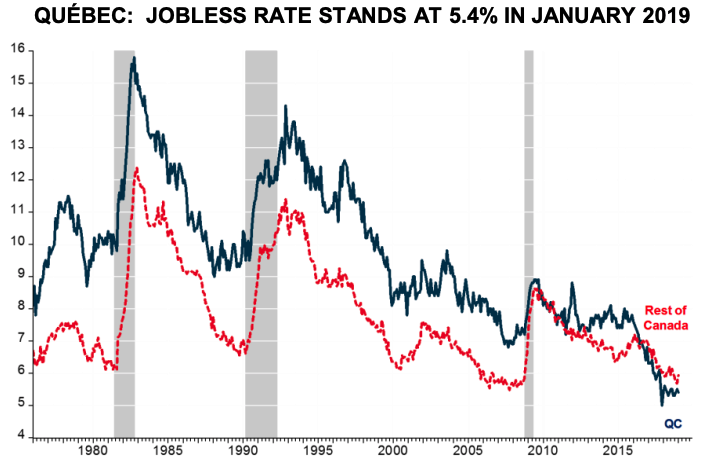 In addition, Quebec is near full employment, as the province’s unemployment rate of 5.4% in January 2019 is the lowest since 1976. This low unemployment rate is also the second lowest among all Canadian provinces. As can be seen from the chart below, Quebec's unemployment rate continues to be lower than the national average. Looking forward to 2019, Quebec’s projected unemployment rate of 5.5% will continue to be the second lowest among Canadian provinces. The province’s projected retail sales growth rate of 3% in 2019 will be third only to BC’s 3.7% and Ontario’s 3.3%. The strength in Quebec's economy will help support economic activities in the province. Therefore, we believe that Cominar’s portfolio of properties should continue to perform well in 2019. Although Cominar has completed the sale of 95 non-core properties in early 2018, the REIT has identified a total of 40 income properties for sale (6 identified in Q3 2018 and 34 identified in Q4 2018). These investment properties held for sale are estimated to be worth about C$188 million and consist of a total of 1.5 million square feet of office, retail and industrial properties. We like the fact 60% of the properties that Cominar held for sale are low-growth retail properties. Once the sale of these non-core assets is completed, Cominar will have a much improved portfolio with better growth outlook. Cominar has 3 major projects that it is pursuing in Quebec City. Its Espace Bouvier project consists of 1 office building and 5 retail buildings with a total leasable area of 271,500 square feet. Five of six buildings have reached completion already. The project’s weighted average yield on cost is estimated to be about 6.5%. Its Ilot Mendel project covers an area of 2 million square feet, and the first phase (which consists of about 500,000 square feet) is expected to reach completion in 2020. The third major project consists of about 1.5 million square feet of retail land and is currently going through application of a change of zoning. Once completed, these 3 major projects should significantly increase its gross leasable area (currently at 11.7 million square feet). There are many intensification opportunities in Cominar’s portfolio of properties. Many of these properties are located along existing and planned transit infrastructure. These properties have the potential to result in significant value creation through intensification and development in the long run. Management will go through some in-depth analysis of its portfolio and will share the results of the analysis with the investment community later this year. Cominar currently trades at a price-to-2018 adjusted funds from operations of 13.1x. This is slightly below H&R REIT’s (OTCPK:HRUFF) price-to-2018 AFFO ratio of 14.4x but higher than Artis REIT’s (OTCPK:ARESF) 11.1x. After several dividend cuts in 2017 and 2018, Cominar currently pays a monthly dividend of C$0.06 per share. This is equivalent to a dividend yield of 6%. The good news is that the company now has a sustainable dividend with a payout ratio of 87.8% in 2018 (based on its AFFO). This is significantly lower than the payout ratio of 113.9% in 2017. Since we are now in the late stage of the current economic cycle, if an economic recession arrives, demand for industrial, retail and office properties will likely decline. This will negatively impact Cominar’s occupancy ratio and rental revenue. As Cominar executes its disposition plan by selling some of its non-core assets, the rental revenue may be impacted temporarily. 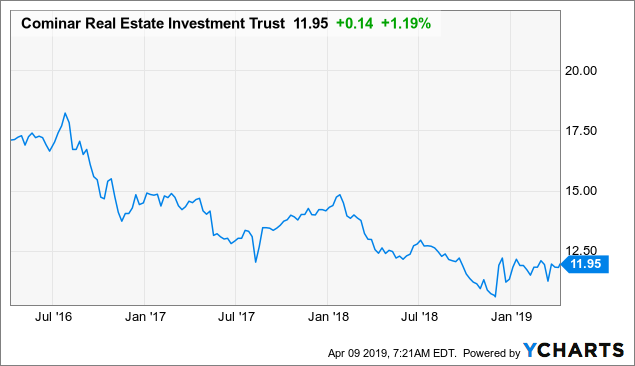 Any disposition of the REIT's non-core properties may result in a temporary loss in rental revenue until the capital is re-invested towards new properties (either through acquisitions or developments). We think the worst for Cominar is over and that the outlook is now much improved. However, short-term volatility is still likely, as the company's disposition plan may result in temporary revenue loss. We think investors with a long-term investment horizon will be rewarded.